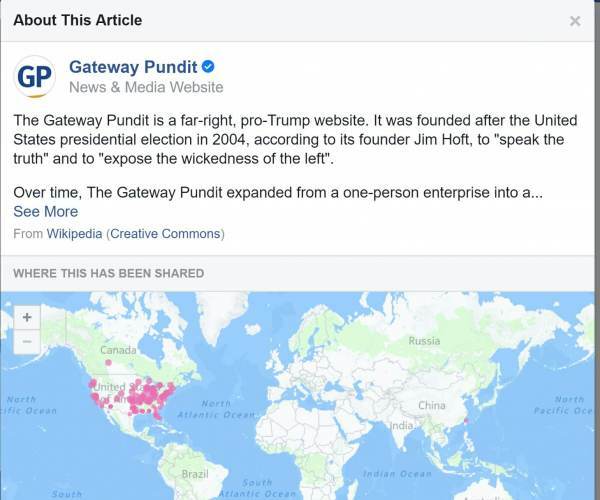 Facebook is displaying a link to Wikipedia’s biased description of the Gateway Pundit alongside all TGP articles shared on the site, warning its users that Gateway Pundit is a “far-right” web site. The social media network has added a small information button, marked “about this article,” next to all posts linking to Gateway Pundit on the site, which displays a pop-up screen to Wikipedia’s misleading description of TGP. 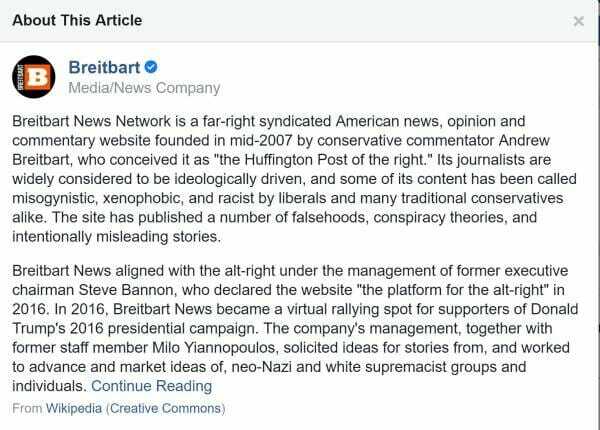 Breitbart News is the only other conservative-leaning outlet that is also smeared as a “far-right sight” on Facebook via Wikipedia. Breitbart’s “journalists are widely considered to be ideologically driven, and some of its content has been called misogynistic, xenophobic, and racist by liberals and many traditional conservatives alike. The site has published a number of falsehoods, conspiracy theories, and intentionally misleading stories,” the Wikipedia description cautions. Other right-leaning outlets like Townhall.com, Independent Journal Review and the notoriously Never Trump National Review also have Wikipedia links next to its articles, but are characterized as “political conservative” websites and are not smeared in the descriptions. Last week Google was under fire for incorrectly stating that the ideology of the California Republican Party included “Nazism.” Google then blamed “vandalism” at Wikipedia for the biased search engine results. The social network’s essentially declared war on conservative media and conservative figures after the election of Donald Trump in 2016. In 2016 Harvard and Columbia Journalism review found that The Gateway Pundit was the 4th most influential conservative news source in the 2016 election. 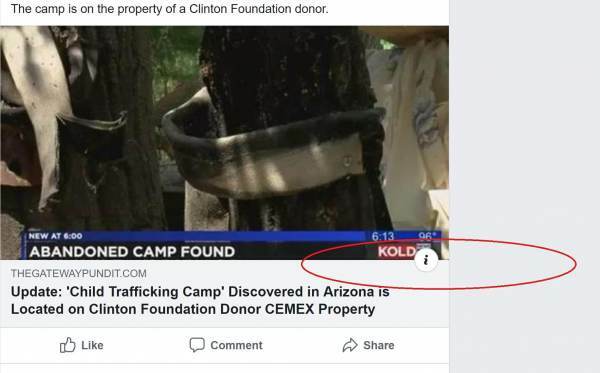 Nonetheless, Facebook is clearly working to repudiate Gateway Pundit as “fake news” by repeatedly altering its algorithms to prevent TGP stories from being shared and displayed in news feeds. Facebook launched a new algorithm in February that caused President Trump’s engagement on Facebook posts to plummet a whopping 45%. A report published in March by the far left organization, Outline, confirmed the conservative publishers were hit the hardest by the recent Facebook news feed changes and the Gateway Pundit was hit the hardest, despite having spent tens of thousands of dollars advertising on Facebook in the past.